Daegu , (??, ? ?, literally large hill) formerly spelled Taegu, and officially known as the Daegu Metropolitan City, is a city in South Korea, the fourth largest after Seoul, Busan, and Incheon, and the third largest metropolitan area in the nation with over 2.5 million residents. The city is the capital and principal city of the surrounding Gyeongsangbuk-do province, although it is not legally part of the province. 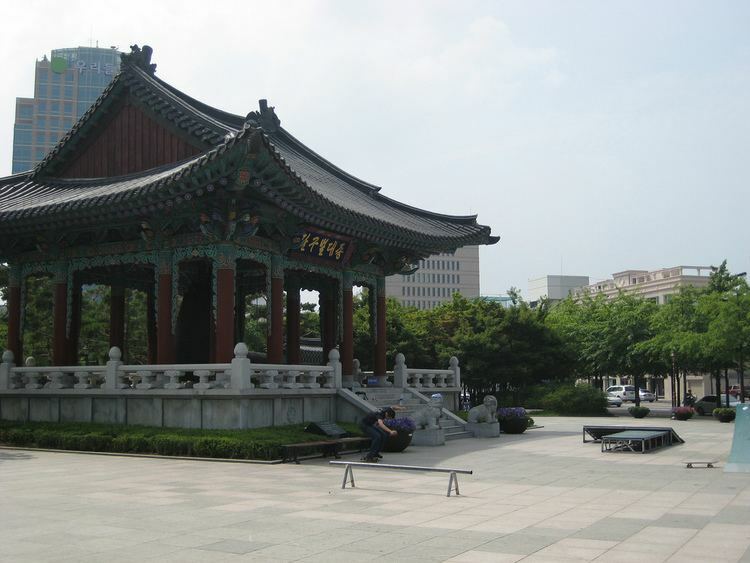 The two areas combined are often referred to as Daegu-Gyeongbuk, with a total population of over 5 million. Daegu is located in south-eastern Korea about 80 kilometres (50 miles) from the seacoast, near the Geumho River and its mainstream, Nakdong River in Gyeongsang-do. The Daegu basin, where the city lies, is the central plain of the Yeongnam region. In ancient times, there was a proto-country named Jinhan, to which the current Daegu area belonged. Later Daegu was part of the Silla Kingdom which unified the Korean Peninsula. During the Joseon Dynasty period, the city was the capital of Gyeongsang-do which was one of traditional eight provinces of the country. Daegu was an economic motor of Korea during the 1960s–1980s period. The humid subtropical climate of Daegu is ideal for producing high quality apples, thus the nickname, "Apple City". Daegu is also known as "Textile City". Textile used to be the pillar industry of the city. With the establishment of the Daegu-Gyeongbuk Free Economic Zone, Daegu is currently focusing on fostering fashion and high-tech industries. Daegu was the host city of the 22nd World Energy Congress of 2013, the 2011 World Championships in Athletics and the 2003 Summer Universiade. It also hosted four matches in the 2002 FIFA World Cup. Archaeological investigations in the Greater Daegu area have revealed a large number of settlements and burials of the prehistoric Mumun Pottery Period (c. 1500-300 B.C.). In fact, some of the earliest evidence of Mumun settlement in Gyeongsangdo have been excavated from Siji-dong and Seobyeon-dong. Dongcheon-dong is one of the substantial Mumun agricultural villages that have been excavated. The Dongcheon-dong site dates back to the Middle Mumun (c. 850-550 B.C.) and contains the remains of many prehistoric pit-houses and agricultural fields. Megalithic burials (dolmens) have also been found in large numbers in Daegu. Ancient historical texts indicate that during the Proto–Three Kingdoms (Mahan, Jinhan and Byeonhan) period, Daegu was the site of a chiefdom or walled-town polity known from that time, according to historical records, as Dalgubeol. It was absorbed into the kingdom of Silla no later than the fifth century. The vestiges of the wall can be seen, and relics have been excavated in the current Dalseong Park. Daegu is a manufacturing industry city. The major industries are textiles, metals and machinery. In the year 2010, Daegu had a regional GDP of $45,387 million with 7.2% real GDP growth rate. The GDP per capita though is well below Korea national average. The quality of the apples grown around the city is renowned around Korea. Many companies such as Daegu Bank, Korea Delphi, Hwasung corp., and TaeguTec are situated in this city, and Samsung and Kolon were founded here. Numerous factories are located in the industrial complexes situated in the west and north sides of the city including the Seongseo Industrial Complex, West Daegu Industrial Complex and the Daegu Dyeing Industrial Complex.